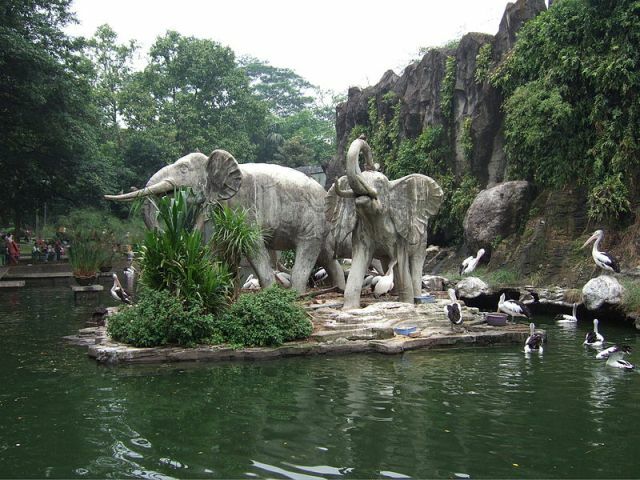 Although many people will agree that the Ragunan Zoo is not the best zoo in Asia, visiting it will still prove to be a worthwhile experience. First, it provides a reprieve from the chaotic streets of Indonesia’s largest city. With its lush tropical rainforest, the zoo is indeed a relaxing place to be. Second, it allows you to be acquainted with different kinds of animals, such as the orangutan, komodo dragons, and the critically endangered Sumatran tiger. The zoo receives the most number of visitors during weekends, as many families go here, especially those with smaller kids. If you are planning to visit the zoo, better plan your trip on a weekday to avoid the crowds. One thing you will notice about the zoo is that there are not enough security personnel roving the area. You may witness a few people freely reaching out to give food to – and sometimes throwing their trash and cigarette butts at – the caged animals. This behavior is most certainly not encouraged, and should report such persons to the authorities at the zoo. Within the zoological park, you will find the Schmutzer Primate Center. As its name suggests, this privately funded zoo was established primarily to protect primates and promote educational campaigns about these creatures. The center provides an artificial habitat for primates such as the orangutan and chimpanzee. When you go to the Schmutzer Primate Center, the first thing you will notice is that it is a lot cleaner and more organized than the Ragunan Zoo. The rules are stricter, too; visitors are not allowed to bring in food and beverages to the facility. Security personnel are roaming around the area, carefully guarding the visitors’ behavior toward the animals. Those who mistreat the animals are immediately escorted out. The center has a library, a theater, and some educational exhibits. It is home to chimpanzees, orangutans, gorillas, monkeys, and crested black macaques. Visitors can observe the gorillas through an overhead walkway that is sheltered by the canopy. The center is also home to the very rare silvery gibbons, which are on the list of Indonesia’s most endangered animals. A visit to the Ragunan Zoo will not only allow you to see Indonesia’s unique primates and other animals; it will also give you an appreciation and understanding of the necessary efforts to protect and conserve such animals, especially those that are endangered. Speaking of which, if you’re traveling to the Philippines with your kids, visit Tagaytay Zoo.